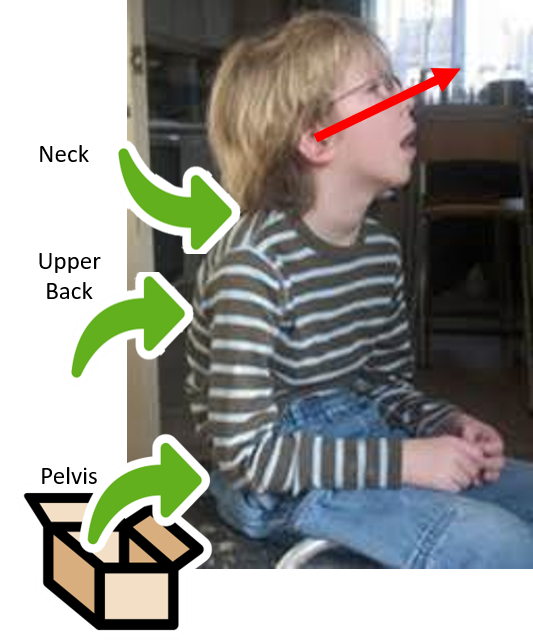 According to several researchers, the position in which the body is held has an impact upon visual spatial orientation. 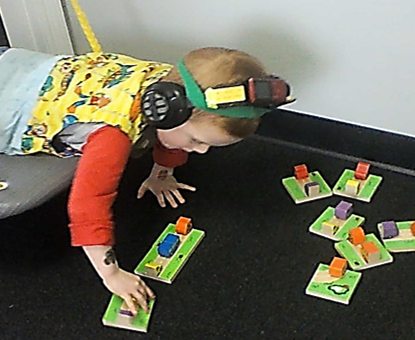 Success in activities that involve spatial orientation are influenced by features such as head position and control of the back. In addition, the slant of the low back is also a key feature. 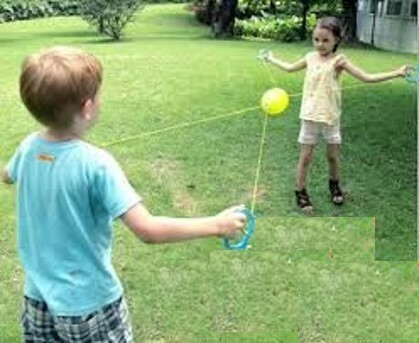 Children who have difficulty with coordination tend to have problems with spatial orientation. These problems tend to impact success with reading, dressing, and social skills. The neck muscles are holding the head on an angle so that the eyes are positioned to view distant, but not near objects such as a book or hands as they manipulate toys. The upper back muscles are not strong enough to hold the shoulders and arms steady. Therefore hands are unable to steady the spatial orientation of objects being used during handwriting, buttoning, or other fine motor skills. The low back muscles are too weak to hold the upper body steady to maintain the spatial orientation of objects during fine motor skills. When the head and body cannot maintain an erect position, the visual field constantly shifts. The shifting moves influence perception of spatial orientation of objects in the environment. Activities with a Zoom Ball incorporate muscle strength through the core as well as the spatial orientation of the target. Many children who have difficulties with spatial orientation typically have underlying weaknesses with muscle strength, especially throughout the core regions of the body. These muscles generally cannot sustain the weight of the head in the “head vertical, mouth horizontal” position. Additionally, the muscles of the upper and lower back are generally unable to sustain an erect posture and need to be strengthened. Without the contribution of these core muscles, the body is unable to assume and sustain postural control. Spatial orientation concepts therefore fall victim to poor posture and body alignment. The muscles of the core regions do not work on an individual basis. Rather, they work together as a team. Remedial activities therefore should be designed to address both underlying features of the weak core strength as well as the intellectual features of deficits in spatial orientation. 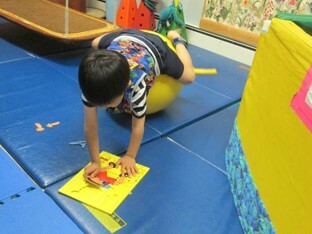 This photo shows a boy who is lying on his stomach over a physioball. His back and neck are extended while he engages the spatial orientation of puzzle pieces. 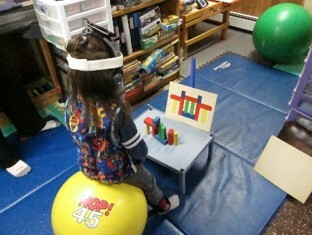 This photo shows a child who is sitting on a physioball while engaging spatial orientation of building a tower of blocks. The back is extended while the head is straight upright. 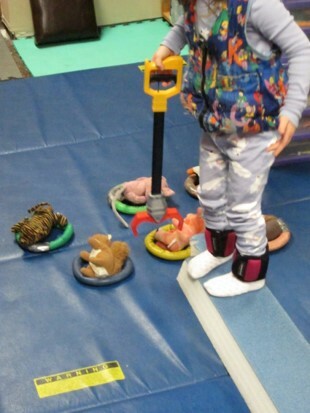 This photo shows a child who is standing erect on a balance beam while using a reacher to place small stuffed animals into rings. 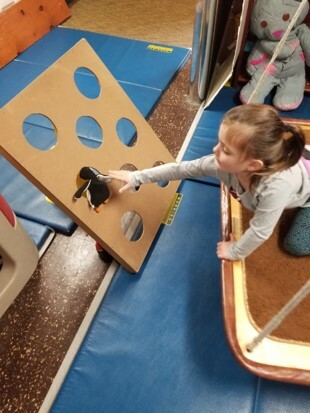 This photo shows a girl who is kneeling on a platform swing, reaching toward a target board of holes to push a stuffed animal through one of the holes. This photo shows a boy who is reaching to build a tower of blocks. 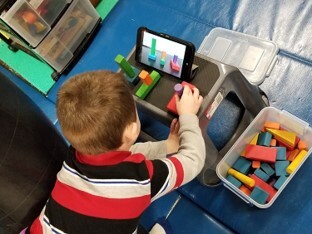 He is sitting on a tire swing and his back and head are extended as he reaches to assemble the blocks as shown on a tablet. 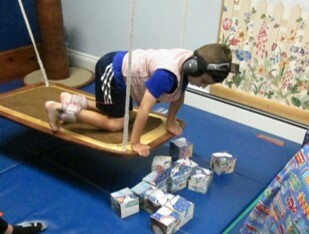 This is a photo of a boy who is quadruped on a platform swing. His upper back and neck are extended as he looks down at a pile of puzzle cubes that he will be working to assemble. 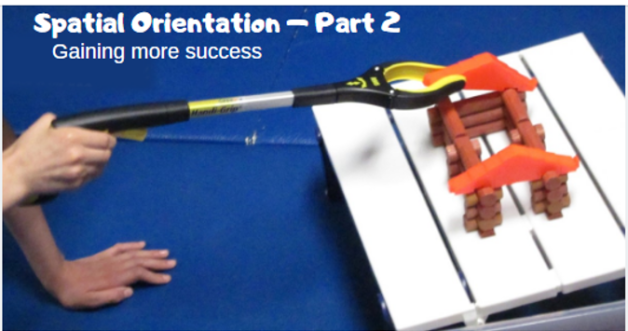 For additional information about spatial orientation and its relationship to postural control, academic and daily living skills, please refer to our blog: Spatial Orientation – Part 1.